In January, I met with my counterparts from across the world at the annual meeting of Arctic museums in Washington, DC. It was a whirlwind 36 hours that was at once enlightening, productive, interesting and inspiring. An Arctic power breakfast! Meg Beckel with (left to right) Mark Brzezinski, Executive Director, US Arctic Executive Steering Committee; Jan Olov Westerberg, Director General, Swedish Natural History Museum; and Kirk Johnson, Director, Smithsonian Natural History Museum. Image: Meg Beckel © Canadian Museum of Nature. As directors leading major museums, this meeting is one of the few opportunities to look beyond our hectic daily responsibilities—administration, fundraising and problem-solving—to take a global look at our work. We focussed on how museums can take concrete action to contribute more to global knowledge and dialogue about the changing Arctic environment. Sunset and iceberg near Nachvak Fjord, Labrador. Image: Caroline Lanthier © Canadian Museum of Nature. It helped that the meeting coincided with the Arctic Matters event of the National Academy of Sciences, and the Smithsonian’s Arctic Crashes symposium. Both of these provided a real flavour for the latest research and approaches to communicating Arctic research to experts and the public. We also confirmed our agenda for the 2016 annual meeting of the Arctic Natural History Museum Alliance, taking place March 13 to 15 during the Arctic Science Summit Week in Fairbanks, Alaska. Our alliance will focus on raising the profile of our respective research programs during this week, and at other Arctic research forums. This giant Arctic floor map was produced by the Canadian Museum of Nature and Canadian Geographic. It’s an educational project that uses the museum’s research to teach schoolchildren about the natural history of Canada’s Arctic. Image: Jessica Finn © Canadian Geographic. We will also focus on digitizing and making our collections more accessible. With more governments committed to open data, we now have a window of opportunity to share our collections data through portals with an Arctic focus. These include the University of the Arctic’s ArcticPortal, the Global Biodiversity Information Facility (GBIF) and the Encyclopedia of Life. Finally, we will ensure the conservation of Arctic species will have a presence at the September 2016 World Congress in Hawaii of the International Union for the Conservation of Nature. Natural history museums really are saving the world. Through evidence, knowledge and inspiration, we making a difference every day, and I am proud to be part of that. Natural history museums collect the evidence of our natural world (our collections of specimens) and have done so for hundreds of years. Natural history museums are a source of knowledge derived from the scientific study of that evidence. And, ultimately, we are a source of inspiration. Inspiration to explore, to connect with, and to discover the natural world around us, all in the hope that we inspire understanding, respect and value for nature. Canadian Museum of Nature botanist Dr. Jeff Saarela collects plants near Cape Dorset, Nunavut in summer 2015. Saarela is co-leading an international research project to document the plants of Canada’s Arctic and northern Alaska. Image Roger Bull © Canadian Museum of Nature. It sounds like a simple three-pronged approach. Simple you say? Actually…as I have found throughout my career, it becomes simple once you focus on what matters. 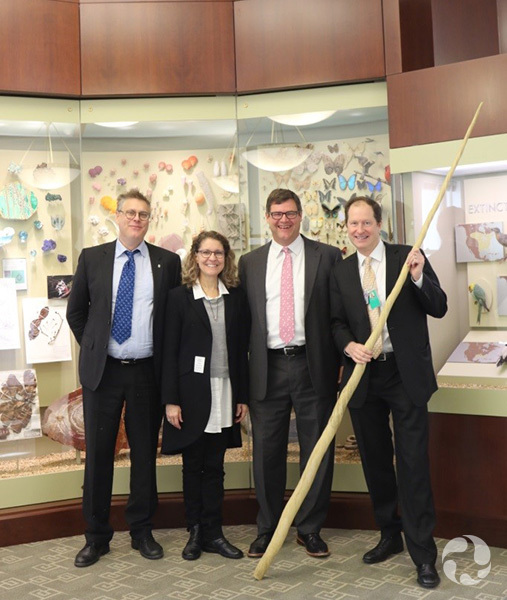 Meg Beckel with (left to right) Jan Olov Westerberg, Director General, Swedish Natural History Museum; Kirk Johnson, Director, Smithsonian Natural History Museum and Mark Brzezinski, Executive Director, US Arctic Executive Steering Committee (holding a narwhal tooth!). Image: Meg Beckel © Canadian Museum of Nature. What matters is that understanding our natural world and how to live in balance with it matters now and in the future. That is what natural history museums do – through scientific evidence, knowledge and inspiration. How we collect the evidence depends on the types of collections we hold and study. The knowledge we create and share depends on the research expertise we have and we build over time. The way we inspire the many audiences we reach also varies by subject, location, size of space, funding, partners and governance structure. As I look at the year ahead, and the ongoing work of the Canadian Museum of Nature scientists, I am confident that we will continue to inform global climate and biodiversity talks, and to galvanize communities to help all of us to truly be citizens working for a better natural future. This entry was posted in Arctic, Collections, Fieldwork and tagged Arctic, Meg Beckel, museum. Bookmark the permalink. Wonderful to see this level of cooperation among museums interested in the Arctic. April of 2016 will celebrate the 50th anniversary of the first of the Joint Arctic (later High Arctic) Weather stations at Eureka, NU. These stations provided a base for Canadian scientists interested in the natural world, like Dr. John Tener, the late Dr. Stuart MacDonald, and the late Dalton Muir (NFB). Perhaps Canada 150 offers an opportunity to recognize their work.